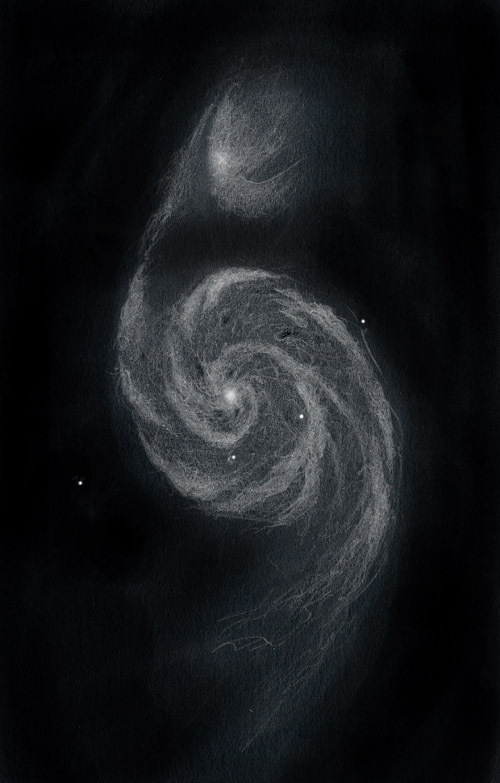 Serge Vieillard created this sketch of M51 during three precious minutes he had at the eyepiece of a 60 cm (T600) telescope. The intricate detail that was visible conflicted with the short amount of time he had to record it. Serge notes that he wished he had hours to spend on the nearly photographic detail, but he did his best to quickly capture the main features of this beautiful pair of galaxies. He did have opportunity a little later in the evening to spend 2 more minutes at the 80 cm (T800) telescope to refine a few more details. This is a wonderful quick sketch. Capturing the arm bridge between these galaxies is wonderful as are all the details in the arms of M-51. T’as quand même bien fait de le poster, tout le monde en profite comme ça, et à toi la gloire interplanétaire !